Transforming skills and academic credentials in "brain currency"
When it comes to Blockchain, Malta certainly has form. Its star has started shining brightly after pulling the trick of attracting Binance, worlds' most active cryptocurrency exchange. 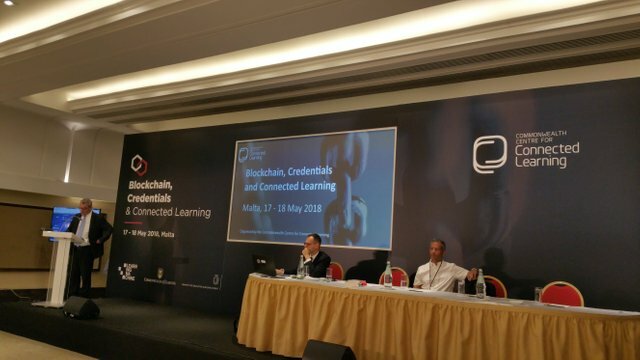 The conference "Blockchain, Credentials and Connected Learning" has been organized on 17th and 18th of May 2018 by the "Commonwealth Centre for Connected Learning" and brought together relevant actors from the world of education and technology, from countries of the Commonwealth (UK, India, Malta, Bahamas, etc.) as well as from the EU. The objectives of the conference were to explore and disseminate ideas about how blockchain could positively transform education. Specifically, the focus was on the potential of blockchain technology to improve student mobility and the fraught conversion of academic credentials into jobs. 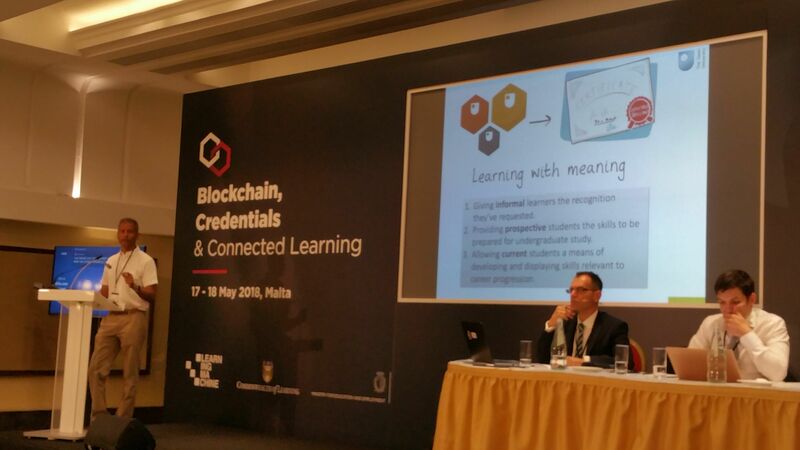 As organizer, Alex Grech opened by stressing Malta's commitement to both digital education - through a National Lifelong Learning Strategy and a framework for accreditation of digital education; and to blockchain technology. He expressed the conviction that small states can and should be bolder than big ones and assume the role of laboratories as decisions are usually easier to reach when the "committees" are smaller. As proof, Malta's Prime Minister has indeed decided to establish a "National Blockchain Strategy"
"Blockchain is not going to solve any problems and will not change anything in education, we will! Wherever there is technology there is a human behind." He underscored the importance of competences, of metacognition and of the personal narrative of every student. To best prepare the next generations, formal schooling is not enough – what is happening in family, society, what happens and what one learns outside the school are of considerable support. He concluded by expressing hope that blockchain will help us capture relevant information about someone's skills from outside formal schooling. Professor John Domingue, director of the Knowledge Media Institute at The Open University presented a series of pilot projects that the KMI students had implemented by using Ethereum smart contracts to allow participants to assess peers and allocate tokens on the basis of how they fare, later turning those tokens into Open Badges. In another pilot, those badges were matched to a database of open jobs across Europe (possibly EURES) and the algorithm was suggesting jobs for which the holder was "almost qualified", given one or two more extra- courses he could have taken. 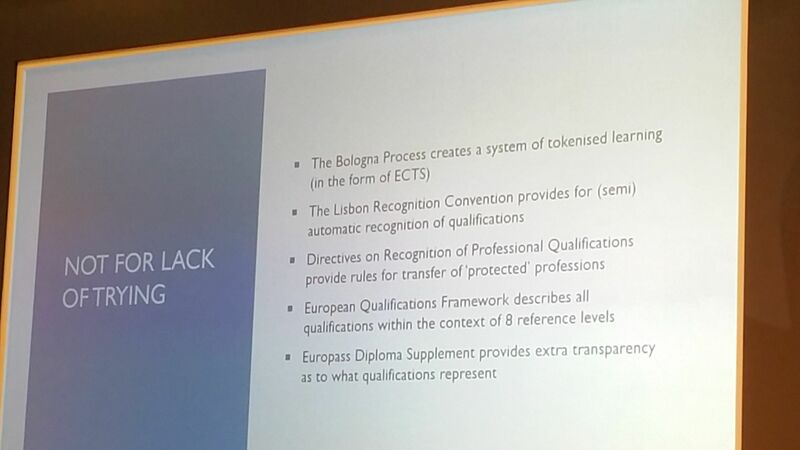 that the Europass Diploma Supplement provides extra transparency as to what qualifications from Member States represent. Starting with the first item in the enumeration above, in the European Higher Education Area academic credentials are described in the same units (the ECTS) which can fulfill the role of "unit of account". He reckoned that, as the Commission observed in a 2016 Proposal for a Recommendation on EQF, "no common arrangements exist for [academic] credit transfer and accumulation of qualifications related to the EQF, [which] makes more difficult to move from one learning setting to another, both within and between Member States." Basically, neither the "medium of exchange" nor the "store of value" functions are currently adequately implemented. Here's where blockchain technology could be the missing piece of the puzzle, the enabling technology that could help Europe turn academic credentials into tokens and store the value of learning. However the ECTS also reflect the value of the issuer, the academic institution which bestows them, not only of the student. And we don't have a commonly accepted system of comparing qualifications from different issuers. Hence the domain is ripe to be disrupted through a decentralized system for comparing qualifications, like the one of the cryptocurrencies. A Program Officer with the Dutch Blockchain Coalition, Dr. Pomp recounted the status of the Dutch initiatives in this technology. The Dutch government is the driving force behind a Government Blockchain Strategy. A large series of pilot projects, sponsored by the Dutch government, are detailed on blockchainpilots.nl and their code is shared openly on Github. One pilot project that caught my attention was designed to encourage behaviours which are neutral or slightly detrimental to an individual but greatly beneficial to the group. Here it was about using ad-hoc truck platoons on highways in order to save fuel and decrease pollution. In a truck platoon, the first truck "displaces the air" for the benefit of all closely-following trucks, but to no benefit for itself. Therefore, one of the blockchain pilot projects attempted to quantify the savings accruing to the following trucks and compensate the leading truck for its "sacrifice" via a blockchain-based smart contract. Another interesting pilot used blockchain to triangulate between maternity care providers, parents and insurers: the first would fill claims for reimbursement of services provided to the parents, which would then be confirmed (or disputed) by those. The insurers would then reimburse only the confirmed claims. A third very interesting project involved using blockchain for Self-Sovereign Identity, something, I am persuaded, would greatly increase the value of Steemit as well, as I have argued in past articles. Under the leadership of TNO (see below), the University of Groeningen partnered with Ghent University in Belgium to implement blockchain-based solutions for improving the student exchange process. This project deserves a detailed treatment and I'll dedicate a full post to it. A professor in C.S. and Engineering at the Indian Institute for Technology in Kanpur, Prof. Prabkhakar's talk was one of the first in which a blockchain-based solution was presented integrated as a component in a larger system architecture, alongside classical software components such as Node.js, Drupal, R+Shiny, MongoDB and MariaDB. The initial solution, MOOKIT, a MOOC platform, has been in development since 2014 using classical technologies and the focus here was on a new pilot looking at integrating some functionalities through a blockchain-powered module. In the next installement I'll present the "Studybits" Dutch study as well as talks on ESCO, Europass and EQAR which, taken together, are illustrating the state of play in building a European regulatory and standards framework in which a blockchain-based solution could bring the missing piece allowing the whole system to benefit from incentive alignment. If you enjoy my posts, please approve @lux-witness as a witness! Thanks for a very detailed summary of that Malta conference. I too agree that "blockchain technology could be the missing piece of the puzzle" here. Although self-Sovereign Identity applications go beyond Digital Diplomas, Learning is indeed a great valuable asset to our society whose value could be stored on the blockchain. Moreover, improving ERASMUS-like exchange processes thanks to a blockchain-based solution could appear very appealing and relevant. Last, political traction for building a blockchain-based ID system, alongside the announcement of progress with a MOOC platform are seen highly positive steps forward too! Looking forward to the next step which might be to see the birth of an EU-wide blockchain platform enabling student exchanges whilst easing student employability. Check the next post for more ! Very interesting and highly relevant topics already in your first part, I am curious for more. Thank you! Your writing is very effective. So, it seems to be a work in progress as they talk about cryptocurrencies. It can be tough for people who are new to it. And it can be tough to get people to accept it as a substitution for fiat. Sounds like a loan or like arcade credits. Like store credit. You got a 14.73% upvote from @postpromoter courtesy of @sorin.cristescu!